"Last one out of the water is a papaya picker!" But even keeping that in mind, Paradise, Hawaiian Style smacks of a certain desperation. Made in 1966, Elvis' star had started to eclipse some, and you can see the beginnings of a spare tire around his midsection. He plays Rick, a womanizing airline pilot who has lost yet another job, apparently for too much fraternization with the flight attendants—today, we might call that sexual harassment. He grew up in Hawaii, and now "I'm going home to get away from trouble." He convinces his best pal Danny (James Shigeta), married and the father of five, to go into business with him—they're going to open up Hawaii's first helicopter taxi service. It's not much of a business plan, but since Rick seems otherwise unemployable, it will have to do. It's a help that Rick has a woman in every heliport—a string of hotel employees and concierges who can throw some business his way. The future of the helicopter limo business takes up most of the movie, and poor Elvis is reduced to singing to a chopper full of show dogs. The inevitable complications ensue—the many women that Elvis is stringing along band together, and the leading man's principal romantic interlude is with the airline's new receptionist (Suzanna Leigh), who wants to be a pilot herself, and buys a dime store wedding ring, so she can pretend she's married and avoid being pawed at by the boss. It would be easier to be more forgiving about this stupid plot if the music were better or more memorable, but unfortunately that isn't the case. Elvis is saddled with cheesy lyrics like "Gee it's great / to be in the fiftieth state," and actually the best musical number isn't even his: Danny's eldest daughter, Jan (Donna Butterworth), sings a Polynesian-infused cover of Won't You Come Home, Bill Bailey?, to much acclaim. There are some nice shots of the islands, though, and you start to get the sense that this movie was made principally to justify an extended stay in Hawaii. The shoot looks as if it were a whole lot of fun; unfortunately, not too much of that shows up on screen. Image Transfer Review: The film has the weirdly oversaturated mid-60s look, and the transfer retains that peculiar palette. The image is largely free of interference, with only a few scratches on the print here and there. Audio Transfer Review: The musical numbers sound especially fine in the remixed 5.1 track, but otherwise the mono is the way to go, to preserve that Elvis-at-the-drive-in feeling that is one of the allures of the movie. Extras Review: Chapter stops and English subtitles make up the whole extras package. 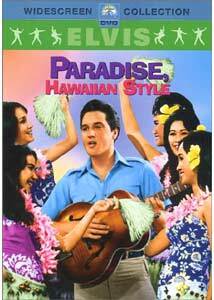 Elvis obsessives will of course need to add this to their collections, but for more casual fans of the King, there's a whole lot of trouble in Paradise, Hawaiian Style.